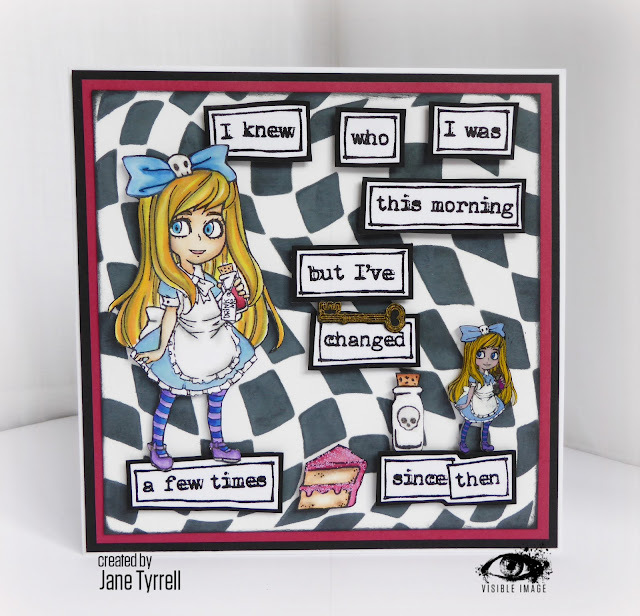 It’s time for more design team inspiration for Visible Image and I am here with another Wonderland sample. 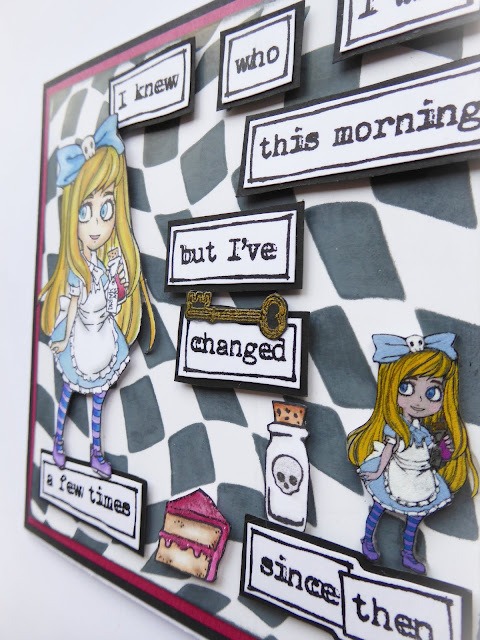 This new release is going down a storm and today I am going to share my first make with the lovely Alice. After making my shrink plastic seahorse and jelly fish for my seagoddess wall hanging which I shared here, I had a light bulb moment that Alice in Wonderland also shrunk when she drank from the bottle, to get small enough to get through the door to the garden. Out came my shrink plastic but this time I decided that I wanted to colour the image so I did this using pencil before heating it. 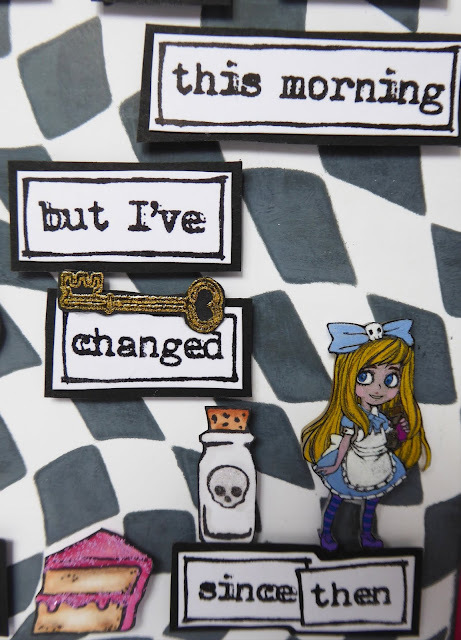 I made a couple of shrunk Alice’s and this shows her full size and with her shrunken self! They are such fun accents to make. 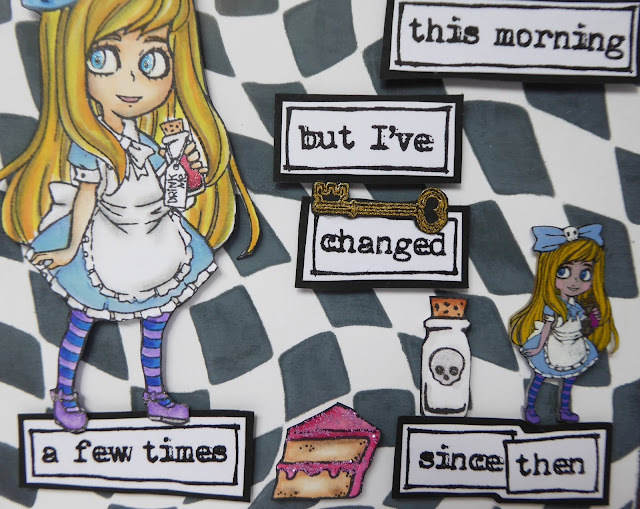 I also made a background using the brilliant Distorted Chess stencil as this works so well with the Wonderland stamps. I went with a black and white version using black soot distress oxide ink. I coloured my Alice and a slice of cake with Promarkers. I stamped and fussy cut out the key and the potion bottle and added some glitter. I also stamped out her words. with a couple of close ups trying to show some of the glittery finishing touches I added. 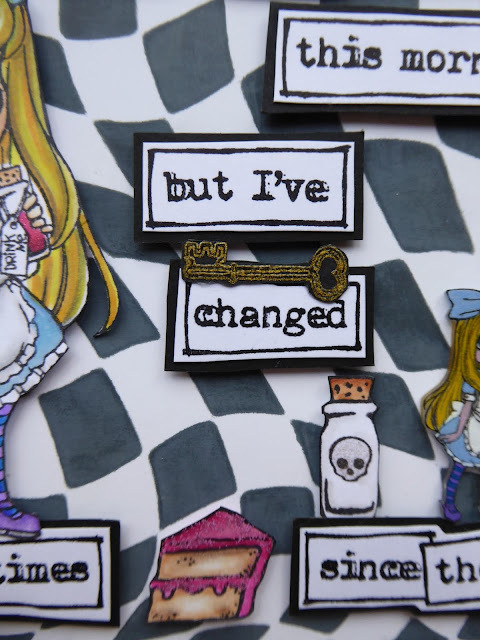 You can see this more clearly, and all my Wonderland samples in the recent Visible Image video over on their Facebook page here. I mounted everything onto foam tape which gives this card a lot of depth. It would be lovely to see you in the Visible Image group over on Facebook. You can add work to the “Show and Tell” album where one randomly chosen winner each month wins a coupon to spend on the website! We will be back later with more Wonderland projects, so stay tuned!